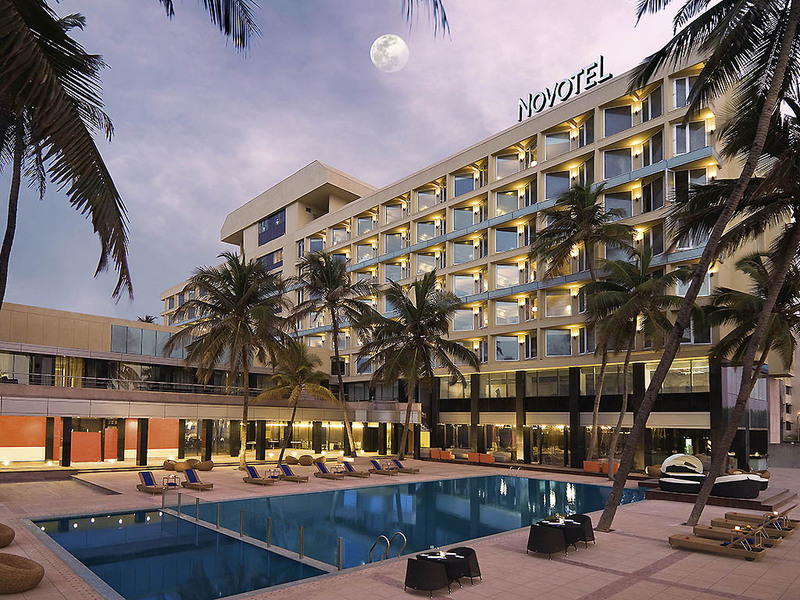 Novotel Mumbai Juhu Beach is centrally located in Mumbai city, on Juhu Beach, close to shopping centres and corporate hub, neighbours the Bollywood Boulevard and is well connected to the landmarks, airports and tourist attractions of the city. Premier Rooms - lounge access with free cocktails for 2 hours and airport transfers free. Rooms are currently under renovation. There will be minimal noise from 0900 a.m. to 7 p.m. Chic in decor and design aesthetics, starting at 29 Sqm the hotel comprises of 203 guest rooms which is inclusive of 131 Superior Rooms, 60 Premier Rooms, and 12 suites. Guests can choose between city facing and ocean facing rooms. A legendary fine dining restaurant, located at the lobby level, serves delicious Chinese cuisine hand-crafted by our chefs. Our signature restaurant, serves a mélange of pan-Indian and world cuisines, 24 hrs a day. Located at the lobby level offering a lavish buffet & à-la-carte service, we recommend that you make prior reservations for lunch and dinner. Seasonal, terrace restaurant, features the forgotten recipes of ancient India painstakingly created by our chefs as a special, unlimited four course treats by the poolside. Olio means 'oil' in Italian. The name signifies the essence of the restaurant. Our specialty restaurant features live cooking, authentic Italian wood-fired pizza ovens. Located at the lobby level. Enjoy tailored services with exclusive Premier Lounge access: breakfast, unlimited Internet, secretarial services, business center/meeting room use, express check in/out, airport transfers, tea/coffee, and evening cocktails. Upgrade fee applies. Relax and enjoy modern contemporary music and a view of the Arabian Sea while sipping a cocktail in this chic sea lounge. Gadda da Vida is located at the lobby level and offers creative food and a wide range of beverages. 친절함이 느껴지지는 않아 조금 아쉽다. 룸에 에어컨 콘트롤이 제대로 되지 않으며, 제대로 룸 크리닝 서비스가 않됨. 회의실 온도 콘트롤도 엉망임. 시설 보수가 필요 할듯 합니다. 객실 집기등도 교체 필요해 보입니다.